(Bloomberg) -- The White House is unprepared to defend itself against a coming wave of investigations by newly empowered House Democrats, who have vowed to probe everything from cabinet members’ ethics scandals to conflicts of interest involving the president’s business empire. President Donald Trump doesn’t have a chief lawyer at the moment. Three weeks after White House Counsel Don McGahn departed, replacement Pat Cipollone hasn’t started on the job as he wraps up ties with his law firm, said a person familiar with the situation. Cipollone, who will be responsible for responding to subpoenas and document demands from House Democrats, has never dealt with a large-scale, politically charged Washington investigation. And he’s taking over an office that’s been depleted by a slew of staff departures. Meanwhile, Democrats are already preparing their first moves. They have vowed to probe everything from Trump’s decision to deploy thousands of troops to the U.S.-Mexico border to the president’s tax returns. They are also likely to dig deeper into the investigation into Russian interference in the 2016 elections. House committee chairs will be able to force administration officials to testify and provide documents. Democrats don’t take over the House until January, and it may take longer for the promised deluge of document requests to start flowing. But Cipollone will need to recruit, vet and get security clearances for lawyers to fill numerous vacancies in the office, including all but one of McGahn’s deputies -- a process that takes time. And many potential hires will need extra time to hand off their cases and clients before they can start at the White House. Cipollone is looking to hire 15 to 20 attorneys amid a series of departures, said another person familiar with his plans. Both people spoke on condition of anonymity to discuss personnel matters. A White House spokeswoman wouldn’t say how many vacancies the office currently has, but McGahn initially had set it up as an operation of 26 attorneys. Several interested candidates have already approached Cipollone, a person close to him said. But the hiring could still take time. Cipollone has spent most of his career working for corporate clients, and doesn’t have a large personal network of former prosecutors and attorneys experienced in dealing with congressional committees, said a person familiar with counsel’s office. 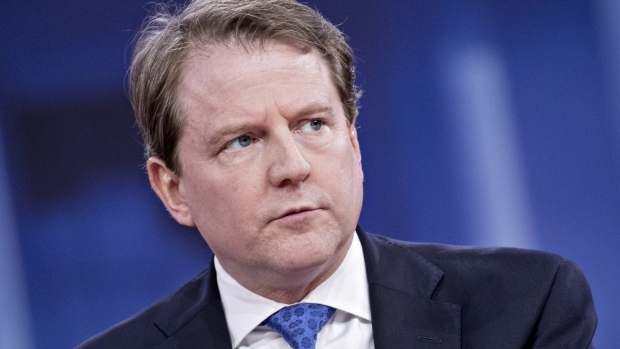 The White House does have a senior lawyer experienced in dealing with government investigations, former Clinton White House lawyer Emmet Flood, who worked on the response to Ken Starr’s investigation and has been serving as acting White House counsel since McGahn’s departure. Trump hired Flood to help manage the response to Special Counsel Robert Mueller’s Russia investigation. But it’s unclear what role Flood will play or even how long he will continue at the White House. When Flood was hired, many White House staff expected him to succeed McGahn as counsel. Trump demonstrated his sensitivity to investigations Wednesday in his first press conference after the congressional election, warning of a “war-like posture” if Democrats targeted the White House with probes. It will be up to Cipollone and his team of lawyers to either respond to those inquiries or fight back against them by making a case for executive privilege. Congressional investigations add a layer of anxiety and distraction for the White House staff who face a risk they will be called to testify. Responding to a subpoena could cost more than $10,000 in legal bills. At the same time, the White House counsel’s office is also unprepared to deal with another bi-product of the elections: large staff turn over. White House aides expect an exodus of staffers who see little point in sticking with the administration through Washington gridlock and hostile investigations. The counsel’s office is responsible for vetting new hires and currently lacks a head ethics lawyer, who reviews appointments for ethics and financial conflicts. The post has been vacant for months.